Animal communication special. $10 off a long distance session by a 30 minute phone call. Animal Reiki is included with the session. Not many animal communicators do both energy healing and communication session together. $45 for one session, regularly $55. Email daisyreikimaster@yahoo.com to get started or if you have more questions. Limit 4 sessions bought total per special. One pet per session only. Special ends April 30, 2019. Must have your session by May 5, 2019. These sessions are for animal communication AND animal Reiki together. If you would like to purchase a session, there are different options to choose from below. ​Please select the number(s) of sessions you would like to purchase. There are packages available for lower prices per session. The packages must be used within 1 year from purchase date. I encourage you to use the sessions at a regular bases to maintain open communication and health of your pet(s). One session is for one pet only. However if you have multiple pets in your household, you may buy a package and use one session for each pet. For example, you have three dogs, you can buy the 3 sessions package at $240 and use each discounted priced session for each of the three dogs. This saves you $60. Click on the black button below to start your pet's healing process now! I can come to your home if you live within 30 minutes from me in Orangevale, near Sacramento and work with your pets in person at the comfort of your home. A $20 traveling fee applies for clients that I have to drive more than 30 minutes to 60 minutes to your home. I will do phone sessions only if you live more than an hour from me. Contact me at daisyreikimaster@yahoo.com for final price if you are unsure if you need to pay the additional traveling fee. Sessions are 30-45 minutes for one pet. Up to 60-80 minutes for multiple pets in one session. Animal communication and animal Reiki can be done without me being in front of your pets. This is considered a long distance session which are just as effective as in person sessions. The session can be done via phone. Sessions are 30 minutes for one pet. Up to 60 minutes for multiple pets in one session. First time client? Not sure if animal communication and animal Reiki will help your pet? Are you deterred from trying out my sessions because of price? I have a solution for you! 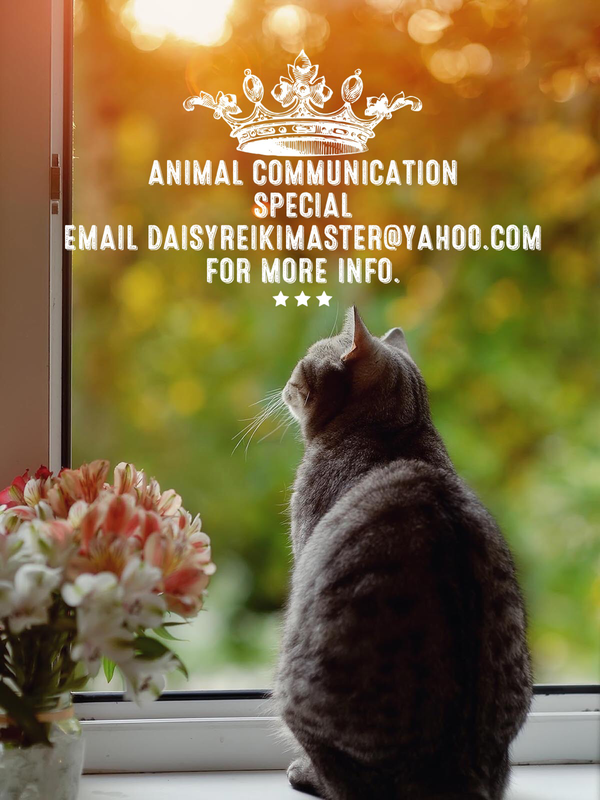 For first time new clients, I am doing special pricing so you can't say no to trying out animal communication and animal Reiki for your pets. Important! You have to mention that you are a first time new client and you would like this new client fee to get this lower pricing. First time session for an in person session is only $60, that's a $40 discount! Traveling fee is voided but you must live less than 45 minutes from me for me to travel to your house. If you live more than 45 minutes from me to get to your home, there will be an additional $20 traveling fee. Long distance is only $40 via phone, 30 minute session, regularly $55. ​The first time client, first session is for the first pet only for both long distance and in person sessions. If you would like another session for another pet, this deal does not apply to multiple pets in multiple different sessions. Therefore, the second pet full animal communication session is back to regular price. Contact me at daisyreikimaster@yahoo.com to discuss this. Looking forward to hearing from you and your pet(s).